Consistently ranked as one of the best in the nation – including a top 10 nod from Frommer’s – this weekly farmers market is the real deal featuring producer-only products. That’s a fancy way of saying the person smiling behind the booth either helped make or grow what they’re selling, whether it’s a hand-blown glass bead necklace or a bushel of tomatoes picked that morning (usually within a 100 mile radius). If you’re driving, pack a cooler – you’re gonna need it. Sundays at the First Tennessee Pavilion from 11 a.m. – 4 p.m. 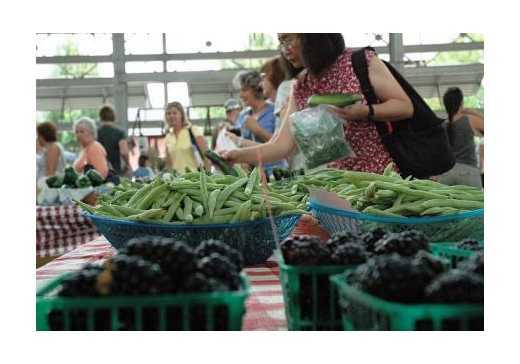 The Chattanooga Market is so passionate about local food they hold festivals in their honor. Market superstars such as strawberries, peaches, blueberries and tomatoes each have their own weeks dedicated to them during their peak seasons. Don’t miss special events such as the Top Tomato Bloody Mary tasting contest or the annual blueberry pie eating contest. The Market’s EPB stage is a revolving door of tremendous talent, having hosted both local bands as well as Grammy winners. Since it’s located on the well-traveled road from Atlanta to Nashville, several bands will stop off on their way back from gigs. The stage is located in the back of the Pavilion but the music travels almost to the parking lot, lending a festive shopping atmosphere. • Waffle Sandwiches, Pizza and Empanadas! Oh My! The Market offers a dizzying array of street food vendors. Restaurants such as Good Dog Hot Dogs, The Yellow Deli and Lupi’s Pizza set up food carts while Chattanooga’s food trucks deliver anything from seasonal slow food to waffle sandwiches, empanadas, Southern BBQ and authentic Mexican dishes are also available.Wash down your authentic Chattanooga food experience with beer, wine or homemade lemonade. If you’re not up for a meal, peruse some of the free samples available from the Market’s many specialty food vendors. Fresh baked bread from Bluffview Bakery, homemade jams and jellies from Daylilies, Rojo salsa from Zocalo, goat cheese from Bonnie Blue and sweets from Robin’s Creative Cakes are just a few free tastes you’ll find each Sunday. Be careful though – one bite and you’ll be reaching for your wallet. The Market’s vendors are handpicked for originality, so chances are you’ll unearth a treasure for the guy or gal who has everything. (We all know at least one). Tie-dyed onesies, hand-turned wooden bowls, flowery sundresses, precious metal jewelry, pottery, photography, hand-painted furniture, hand-forged metal artwork, lotion, bath salts…you name it – they’ve got it. Not only is the Market a chance to support local farmers and artisans, but each week offers a charitable component. Each season the Market donates around $200,000 to local charities, including Jack’s Chattanoogins – a baldheaded festival benefitting kids with cancer. The idea, launched by eighth grader Jack Skowronnek, is that people volunteer to shave their head while soliciting donations from friends and family. This year raked in nearly $40,000 (and a lot of hair). One of the benefits of the Chattanooga Market is the breadth of local food options, including free range and grass fed meat. Barton Creek, Sheerlock and Tennessee Grass Fed Farm offer lamb, beef and pork, while newcomer Dazi Acres offers Cornish Cross broiler chickens and heritage-breed hogs. Cooking demos from top Chattanooga chefs are sprinkled throughout the Market season. The Beast Feast kicks it off Memorial Day weekend, pitting top barbeque cookers against one another in a smoky showdown. Five Star Food Fight in August and Cast Iron Cook-Off in September challenge local chefs to create gourmet meals using only ingredients from the Market. With all the excitement it’s easy to overlook the purpose of a farmer’s market. But the folks who schlep their homegrown goodies there each week deserve some kudos. Conventional, organic, hydroponic…it’s all represented. Take some time to ask where and how their fruits and veggies were grown. They’re usually more than happy to give you an earful (of information…and corn when it’s in season). While the market has all the ingredients for a great meal, there are plenty of ready-made bites to gnosh on while you shop such as authentic kettle corn, German pretzels or Taiwanese pork buns. Rosemary Knoll offers original tapenades and pestos for a quick pasta meal, while The Chef and his Wife sell heat-and-eat entrées for two. Take them home in your cooler for a stress-free dinner after a great vacation.